Jarvis AR3 Series offers bright, efficient lighting. 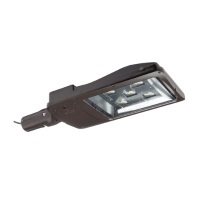 It is highly adaptable for applications including parking lot, roadway, and flood lighting. This light features heavy-duty LEDs. Less diodes are needed to create equal or more light. The AR3 Series is offered in combinations of 3, 4, and 5 LEDs. The LEDs are contained within a tempered glass lens, protecting the light fixture from the environment. Mount is adjustable to allow for both vertical and horizontal tenons. It consumes 150W of energy which makes it an ideal 400W-500W metal halide fixture replacement.